One of my pet peeves with Cities:Skylines is that you don't have access to the entire map from the beginning. I often find myself building something temporarily to get started, only to demolish it later. I can't place my sewer outlet where i want it, and can't place the water pump where I want it either. Yet, I don't want to play in sandbox mode because I enjoy having to build up my income as I go. 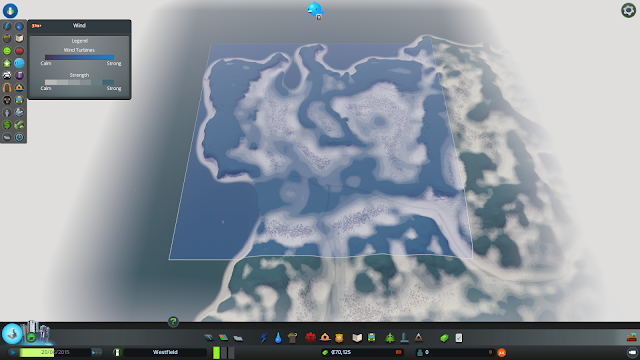 To combat this situation, I created a set of saved-games where the entire map is already unlocked. 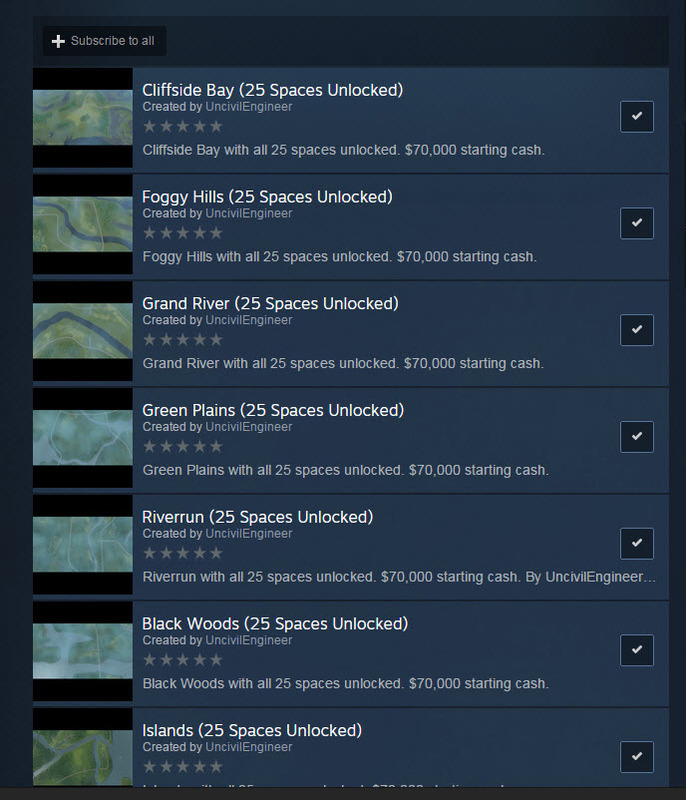 I had to use mods to create these saved-games so the service buildings are all unlocked too, but I made it so you start with the standard $70,000 (give or take $100). I made one for each of the out-of-the-box maps. Because they're saved-games, you have to load them instead of starting with a new game, even though they're completely empty ready to be built upon. 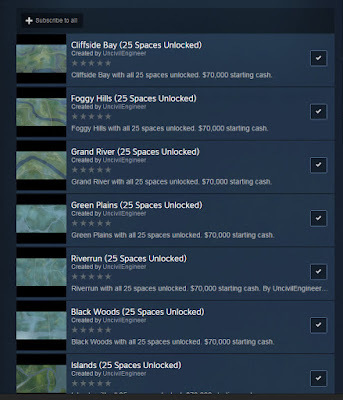 You can subscribe to the collection on Steam by clicking here. 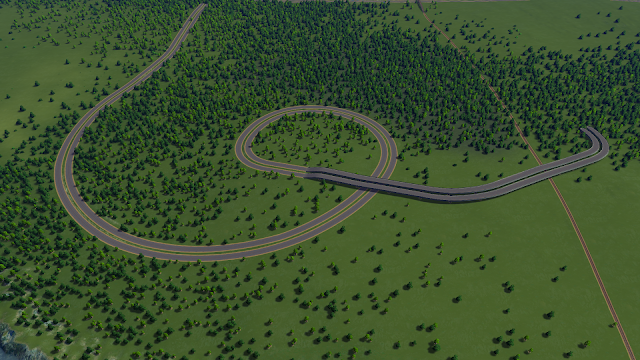 Using the two sets of Highway Tools, you can easily create parallel highways with varying sizes of curves and degrees of curvature. 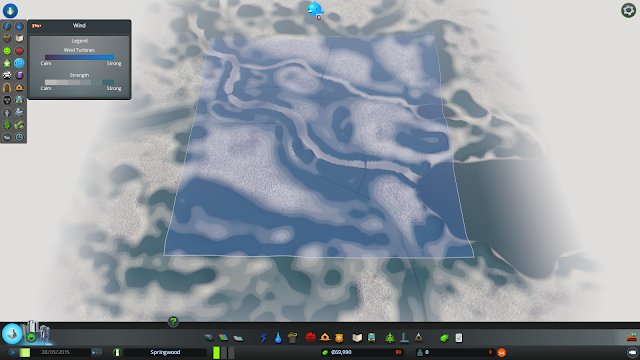 If you're lazy like me, you might have trouble making highways perfectly parallel. I usually eyeball it, get it "close enough" and live with it. Despite my laziness, I'm also a little OCD so I've always wished there was an easier way. To solve this problem, I created two sets of highway assets. There's a "Raised Highway" set and an "At Grade (Flat) Highway" set. Each has 3 radius sizes and each size has 3 angles. 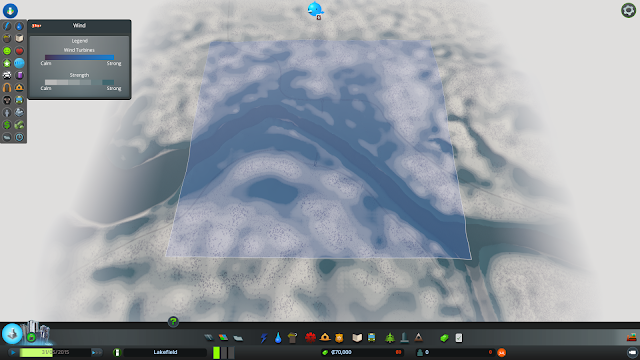 The raised highways can be downloaded from Steam here. Layout Tips: The large radii assets snap together easy. The smaller radius ones will sometimes have overlaps. To deal with this, I will demolish a small piece and replace by hand, or leave a gap and fill with a short straight segment. Go incinerator-only and crematorium-only while making sure to zone residential slowly. Landfills provide a maximum of 15 trucks vs the incinerators 27. Once a landfill is full, it can’t receive more trash until additional space has been created through emptying. While set to “Empty”, trash trucks will haul trash from the landfill to the incinerators or another available landfill. If you can’t empty a landfill right away, you should turn it off. The trucks aren't utilized by other landfills, so you're better off saving the expense of keeping it open. 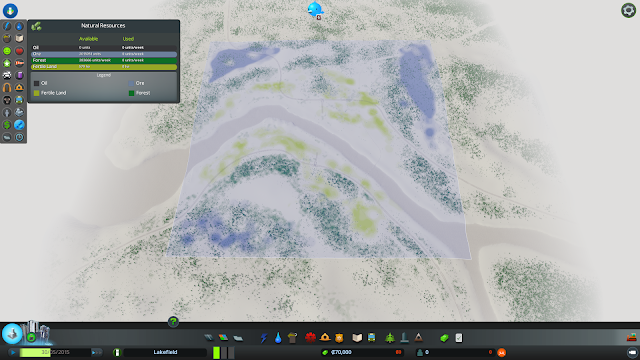 You can't move a landfill until it's been completely emptied. While emptying a landfill, a large number of trash trucks will flock to it, thus creating a potential traffic problem. Additional trash can't be added during the emptying process. Landfills create pollution, but no noise. Incinerators create both pollution and noise. Both landfills and incinerators have an operating radius, so in larger cities you can't just place them in one corner. Trash truck efficiency is diminished in cities with heavy traffic. You don’t have to use landfills. You can go incinerator-only. I prefer this method because it removes the number of variables involved with balancing supply and demand. I don't have to worry about both picking up trash and emptying landfills at the same time. Build extra incinerators and/or landfills and turn them off one at a time until you find the right balance of supply/demand. The key to avoiding death-waves is to have a more consistent rate of births. 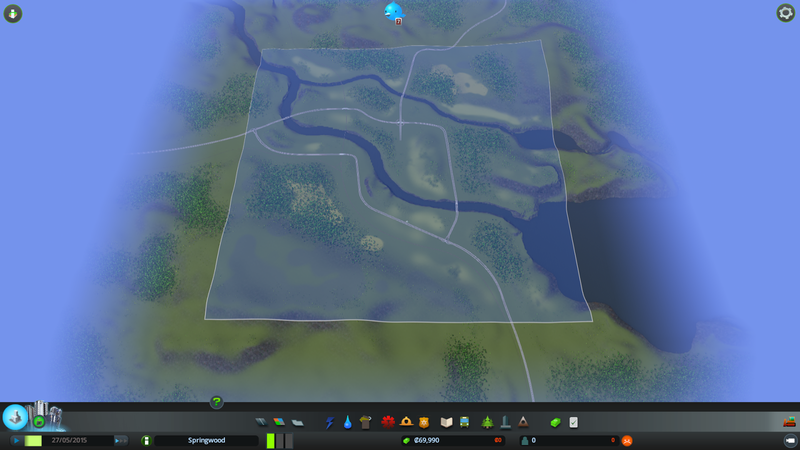 When starting to populate a newly constructed residential area, don’t zone the entire area at once. 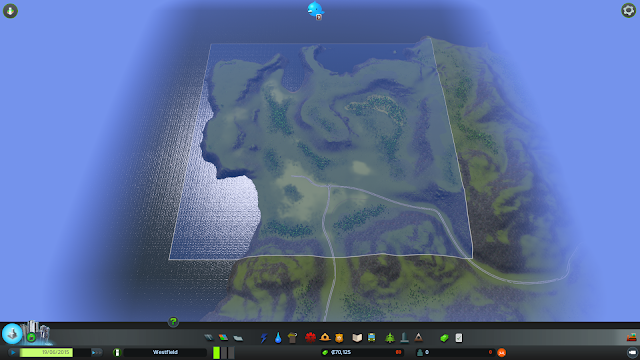 Add to the residential area slowly. 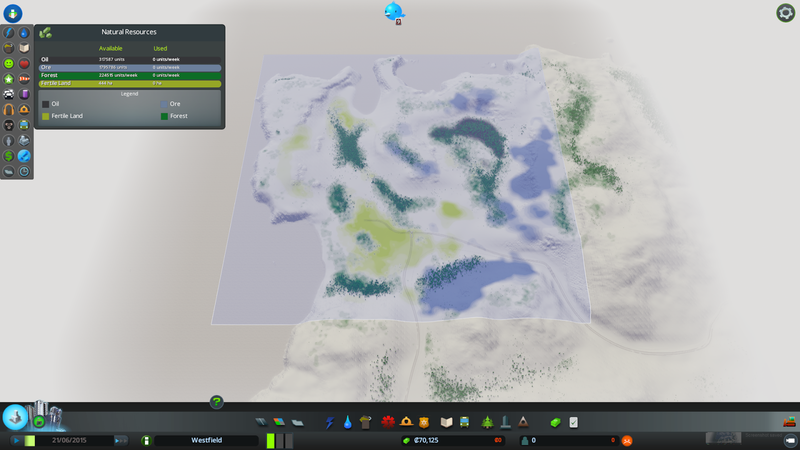 This allows the lifecycles of the CIMs to be spread out and not all hit old age at once. 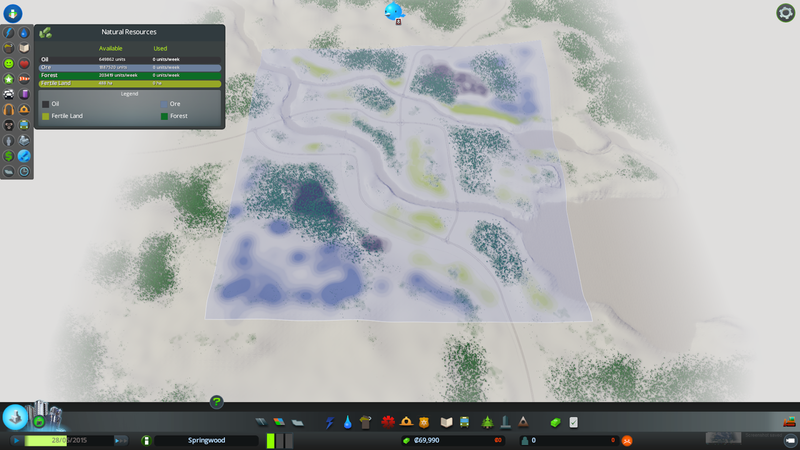 Remember that you can turn deathcare buildings off and on as needed to handle supply/demand. You can also increase the budget as needed to increase/decrease the number of hearses. 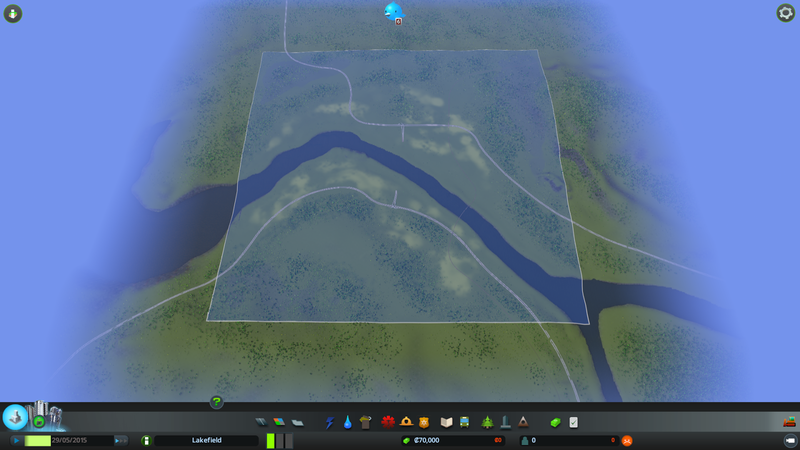 Keep an eye on your population stats to notice any birth waves that can then turn into death waves later down the line. Cemeteries provide a maximum of 10 hearses vs the crematorium's 7. Both deathcare buildings have a service radius, so in larger cities you can't just place them all in one corner of the map. Crematoriums produce pollution while cemeteries do not. Once a cemetery is full, it can’t receive more bodies until you start to empty it. If you can’t empty it right away, you should turn it off, thus not paying more money to keep it running. The extra hearses won't be sent to help out other cemeteries or crematoriums. While emptying a cemetery, a large number of hearses will flock to it, thus creating a potential traffic problem. While set to Empty, hearses will take bodies from the cemetery to the crematorium or other cemeteries that have room. Hearse efficiency is diminished in cities with heavy traffic. You don’t have to use cemeteries. You can go crematorium-only. I prefer this method for the same reason as I gave in the trash tips: It's easier to manage. If you don't want to bother picking up the dead bodies, you can demolish the building instead.